Kyoto is an amazing city – a mixture of ancient culture and modern amenities. A center of culture in Japan for over a 1,000 years, Kyoto is filled with fine architecture, gardens, art, food, crafts, music, and more. Look closely for small aesthetic details, everywhere. It is one of the most beautiful and interesting cities in the world. Among the modern city buildings, are treasures of ancient Japanese culture and art. There are 2,000 temples and shrines in the city, as well as numerous gardens, restaurants, and teahouses on alleys and streets lined with trees and small traditional shops. Kyoto became the capital of Japan in 794. Surrounded on three sides by mountains, Kyoto made an ideal site for the capital. For over 1,000 years, Kyoto was the center of art and craftsmanship in Japan. In 1868, the capital was moved to Tokyo. Kyoto today is a modern Japanese city with all the amenities of any other Japanese city of its size. Yet, Kyoto is unique in its aesthetic appeal. Much of the city is filled with modern architecture, and many of the same businesses found elsewhere in Japan. train station and a restaurant at the top of Kyoto Tower. Nightlife varies from traditional geisha clubs and high-end Kyoto cuisine, to Japanese fast food, international restaurants, and western-style beer pubs. What makes Kyoto unique is that, mixed in with its modern architecture, are 1,200 year old temples, one-of-a-kind restaurants, craft shops, small family-run manufacturing businesses, peaceful hikes, riverside paths, and streets that take you back in time with the historic wooden architecture of teahouses and shops. Everywhere, small artistic touches can be found in doorways, entrances and gardens. Kyoto is full of surprises. A walk across town can reveal countless scenes of detail and beauty. These may be on a grand scale, or in the isolated corner of an entryway. History and ancient architecture are appreciated in Japan. Many of Kyoto’s ancient buildings are very well preserved. In 1994, UNESCO placed 17 of these historic properties on its list of World Cultural Heritage Sites. The Historic Monuments of Ancient Kyoto (Kyoto, Uji and Otsu Cities) includes temples, shrines, and a castle. These sites World Heritage Sites are all amazing in their own way. Still, they represent only a small portion of the many incredible places to see in Kyoto. The beauty of Kyoto is enhanced by the variety of its seasons. In the spring, around the beginning of April, the Japanese ornamental cherry trees, or “sakura”, bloom and can be seen in the gardens, temples, and shrines, and lining the rivers that run through the city. These trees in bloom are an incredible sight. Every single branch of a sakura tree is completely covered in soft pink and white blossoms. In mid-November, the leaves of Japanese maple and other deciduous trees change colors and line the hillsides and gardens with gold, orange, and brilliant red. The mountainsides along the Hozugawa River in Arashiyama become a patchwork of red, orange, yellow, and green. Gardens and temples around Kyoto fill with beautiful fall foliage (“koyo”), as well as tourists and photographers trying to get the perfect picture. At different times, many varieties of flowers fill the gardens of Kyoto and add their own distinct feel to these spaces. The blossoms of plum, apricot, and peach trees, hydrangea, iris, and many others can make each visit to Kyoto different from the last. The food in Kyoto is excellent. Whether you like traditional Japanese, modern Japanese, or foreign food, Kyoto has everything. 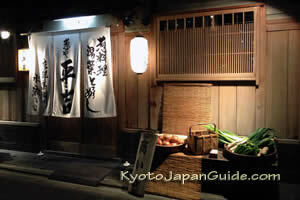 As elsewhere where in Japan, many restaurants in Kyoto specialize in one particular type of Japanese cuisine. Sushi bars, noodle shops, Korean bar-be-que (“yakiniku”) or grilled chicken (“yaki tori”) restaurants, etc. may be found throughout Kyoto. There are also numerous Kansai region specialty restaurants, serving savory pancake (“okonomiyaki”) cooked at your table, or battered octopus (“tako yaki”). For visitors who miss food from other parts of the world, there are also many restaurants serving Thai, Mexican, Italian, American, French, Spanish, Indian, and Chinese food, among others. The variety of food in Kyoto is impressive. Kyoto has an impressive transportation system that makes it easy to explore the city without your own vehicle. There is an extensive train and bus system run by several local and regional enterprises. There is no airport in Kyoto, but there is an easy train connection between Osaka’s Kansai International Airport (KIX) and the city. The JR West Railroad’s Haruka Express train connects the airport with Kyoto and takes just 73 minutes. The Shinkansen bullet train also stops in Kyoto, and connects the city with the rest of the country by high-speed rail. Several train and subway lines run throughout the city. Local and city buses have extensive routes, as well. Taxis are easy to find, and like anywhere in Japan, they are spotlessly clean and run by courteous drivers. Wherever you want to go in Kyoto, it is easy to get there by public transportation. Accommodations in Kyoto range from modern, luxury 5-star hotels and upscale traditional Japanese style inns (ryokan), to backpacker guesthouses, hostels, and budget ryokan, with a wide variety in between. Many accommodations are located close to Kyoto station. Though there are many rooms in Kyoto, always plan your trip well in advance if you plan to stay in the city during peak times, such as the early spring cherry blossom (sakura) season, the late autumn colored leaves season (koyo), or during any of the major festivals or holidays. Kyoto is a fascinating city. It rivals any of the world’s major historic cities in terms of arhcitecture, art, beauty, and cuisine. If you have never been to Kyoto, start planning your trip, today!